Raven Maven wrote: ^ Thanks. I think it's more "I don't want to hear your excuses - this is my vacation and I expect unlimited diet Dew!" Holiday World has sent us a press release regarding a change in plans for their 4th of July celebration. With no end in sight to the extreme hot and dry weather conditions, Holiday World officials decided this morning to cancel plans for fireworks on the 4th of July. “It’s just not worth the safety risk,” says the park’s president, Dan Koch. “We sorry to disappoint our visitors, but we think they’ll understand. Meanwhile, we wish everyone a safe and happy Independence Day!” Koch added that despite the cancelled fireworks, the park will remain open an extra 30 minutes on July 4, until 9:00 pm CDT (10:00 pm EDT). 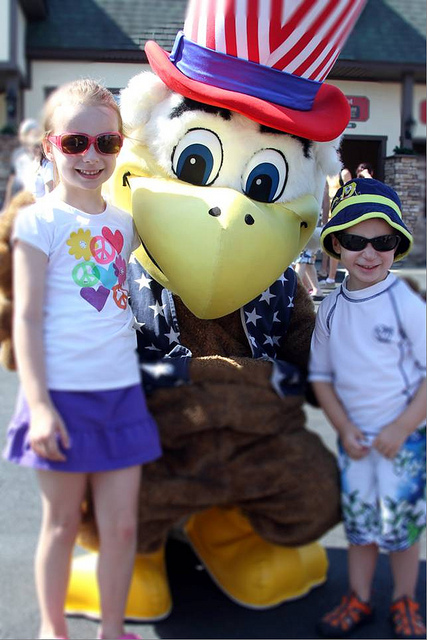 Holiday World is the only park in the nation with a “4th of July” themed section, with such rides as the Freedom Train, Liberty Launch, and the new Sparkler vertical swing ride. For more information about Holiday World & Splashin' Safari and this season’s new Mammoth – the world’s longest water coaster, visit HolidayWorld.com or call 1-877-Go-Family. No surprise, it has been really dry here in St. Louis and a lot of the fireworks displays are being cancelled for the 4th also. New Voyage POV with the modified turn-around. They shot it on July 3rd with a GoPro camera and will be posting new ones of Raven and Legend soon. Finally going to the park for the first time on Sunday. After looking at how crowded the water park was today on their webcam, I'm starting to think I should have planned two days. The weather's starting to look a little iffy as well. I'm sure I'll have fun no matter what happens, though. I'll just go with the flow. ^I have to agree with you: one day inside Holiday World just isn't enough especially if you're planning to ride both water side and ride side. What I'm planning when I get there is two days: one day for the water side and the other day for the ride side. With two days inside the park, I'm sure you'll get all the rides you ever need. "Hey, I'm here on your bed and I can give you all the rest you ever need." megametal wrote: Finally going to the park for the first time on Sunday. After looking at how crowded the water park was today on their webcam, I'm starting to think I should have planned two days. The weather's starting to look a little iffy as well. When I went earlier last month, I waited at the ropes in the 4th of July area and headed straight for the Voyage. After one ride, all of the coasters were crowded so then I waited at the ropes in the waterpark. Everyone will run straight for Mammoth and it will be crowded all day. Try to get in front with the ropes and you will have to sprint! I was the second boat of the day and when I got off, the line was out of the entrance (probably 5 minutes after they dropped the ropes). I went to Wildebeest afterwards and there was absolutely no wait! Do Wildebeest once and then hit the rest of the slides with no wait. Then go to the theme park after lunch or so, I walked on the front row in an empty station for Legend and Raven! Everything was under 5 minutes of waiting after lunch! Do waterpark when it opens remember! Heres the thing though...crowded at Holiday World is a Light day at CP. When youre used to 1+hr waits, a full Voyage queue is like 30min if I remember correctly and thats AWESOME. Granted, the water park does get a bit nuts but thats expected. Still, a crowded day at HW is still a walk in the park compared to the big parks. Holiday World has sent us a press release regarding tonight's airing of Insane Coaster Wars, which includes a segment about The Voyage. For the second time this week, a ride at Holiday World will be featured on a new show on the Travel Channel. The Voyage will be among four wooden roller coasters on Sunday’s episode of “Insane Coaster Wars.” A production crew from Travel Channel visited Holiday World for two days in early May to shoot footage of Voyage and the park. Voyage has been voted the #1 Wooden Roller Coaster on the Planet every year since 2007. This 1.2-mile coaster offers more "air time" than any other wooden coaster in the world. Voyage was featured in the “Wood Takes a Thrilling Turn” cover story of last week’s New York Times’ science section. In advance of the show, fans were encouraged to vote for their favorite wooden coaster last month on Travel Channel’s website; the winning coaster will be announced at the end of the “Splintering Speedsters” episode, which premieres Sunday, July 15, at 7:00pm CT. It will air again next Thursday, Friday and Sunday. Meanwhile, Holiday World’s Pilgrims Plunge is included in an episode of “Xtreme Water Parks” airing on the Travel Channel at 9:30pm CT on Thursday, July 12, and again at 1:30pm CT on Saturday, July 14. Pilgrims Plunge, the world’s tallest water ride, is a classic “shoot the chute” ride, featuring an open-air elevator which lift boats filled with riders 135 feet in the air. An August episode of "Xtreme Water Parks" will include the park’s two water coasters, Wildebeest and Mammoth. The Travel Channel is available in nearly 96 million U.S. households. For more information about the parks, named the #1 Water Park in the Nation by TripAdvisor.com, visit HolidayWorld.com or call 1-877-Go-Family. ^Yessireebob, that should encourage the riders and amusement park flyers to come out to Holiday World." So now it begs the question: what will this park do next as an encore. I mean, you've got two awesome water coasters, a couple of woodies that are slated to be fitted with Timberline trains, and free sodas are served throughout the park. So methinks I have an idea and I'll toss it out for free: another themed area! Of all the hoildays that are still left, how about an Easter theme? I can think of two rides that'll fit this area: One, a mad mouse coaster using rabbits-shaped cars and it's called "The Bunny Hop"; and two, a tea cup ride in which the cars are shaped and colored like Easter eggs. Then put in a candy shop that sells jellybeans, chocolate eggs, and other Easter treats and you've got yourself EASTER!!! How's that for an encore? Of course, this is just wishful thinking. I have no idea of any rumors nor what Holiday World will be putting in next, but I thought Easter would fit the bill nicely. What do all you riders and amusment park flyers think? "I think you typed enough and should come to bed. You need your rest."